than a toasty little nook! These are all so creative and inspiring. I'm a big fan of the built in window seat. I love the way all these take an awkward space and make it functional, attractive and add storage. I always wanted a little window seat. They look like such peaceful happy places. Love these photos. That's all I need in this heat. A little place I can crawl into with a book or a magazine. That, and great ac. I totally agree, these are SO cozy and wonderful! And the third to last pic with the four beds… what an amazing room! Oh, I love these!!!! My parents summer house had a long upstairs hallway lined with window seats flanked by built in bookcases…..brings back wonderful memories! The first image is divine–a girl's dream! These nooks are all very inviting! Although i don't have a window seat in my home, i've always admired them. Good book, cuppa (or perhaps a wine depending on the time of day), a magazine when the book gets heavy going, a cat that doesn't bite…the possibilities of nooks are endless and wonderful! I always wanted a cozy nook of my own as a child in which to create my own little beautiful corner of the world. You have inspired me Zhush…I have a funny room called a 'sewing room' aka no windows, in the basement that I need to use as an overflow guest room when the kids come to stay. It has been a bit of a challenge to decorate, but if I think of it as a 'nook' rather than a room…well, it just might work. Perhaps a sleeper cabin on the Orient Express??? I came across that second nook a while back and i still love that little nook! I want a 'cino, a book, a cozy throw and to be curled up in one of those fabulous spots! What a great post, and your poetry is so cute too! 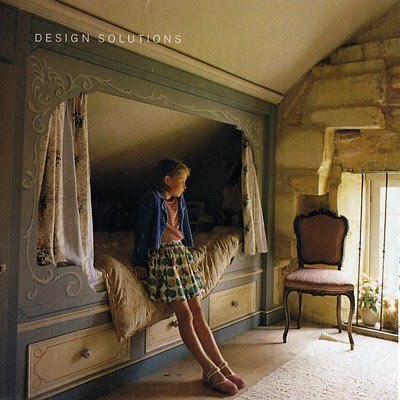 These pictures are great inspirations for interior modeling! I'm taking notes :). So true! I don't think even as adults you ever loose your desire to cozy up in a special corner. Fantastic examples ro dream about!!! Wonderful! I think the inner child in us yearns for our own little secure cozy space! I want a nook! How fun would that be? It's like a fort almost. Now I'm dreaming of nooks! I absolutely adore these all. I just saved about 10 of these in my inspiration folder. LOVE them! Great finds! After a busy weekend, what I wouldn't give to curl up in a cozy nook with a book – especially on a rainy day like today! I particularly like the ones for children. There's something magical about them. Thank you for these! the tufted nook and the room with the four bunk beds are great! I've ALWAYS wanted a little space like this – I even tried to talk my parents into randomly added a bay window to our house haha. OHMYLORD! i need a hidey-hole! these would be perfect for me! LOVE THEM!!! Me neither! Something so safe and secure about them. I could spend all day in one of those with my laptop. Cozy bliss!! These are such perfect little spaces. Would love to have one in my home! oooh, so pretty and cozy. i love #2 and #7. Oh these are wonderful! I've always dreamed of having a cozy little nook in my place. LOVE all of these! so very cool! 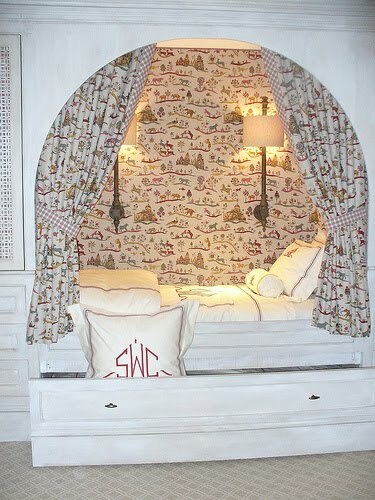 I die for these kinds of nooks! I so want one. I love these. What great images. I love these! I always wished my bed was in a pocket like this. Since I just relocated, I am still working on furnishing all the 'functional' (okay, necessary) spaces…but I cannot wait to get to the details of spaces just for pleasure (hello reading nook!). I'm a hound dog for nooks! We stay in this glorious condo in Seaside, Florida with a nook that can only be reached with a 12-foot ladder. When you climb to the top, there is a queen bed inside. It's marvelous! Oh how I love a snuggly nook. I agree. Cozing up with a hot tea and a great book in a little nook is the best!! that little attic looking nook that the little girl is standing in front of is magical. Love nooks they are little private sanctuaries. I love the first one with all the pink fabric! Those are so pretty!!! I love great little spaces like that. 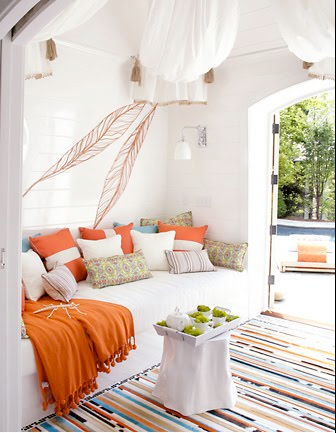 I love nooks and these are great examples of inviting places to retreat to within a home! oh, I love me a nook!!! Great pics!! So many great ideas! 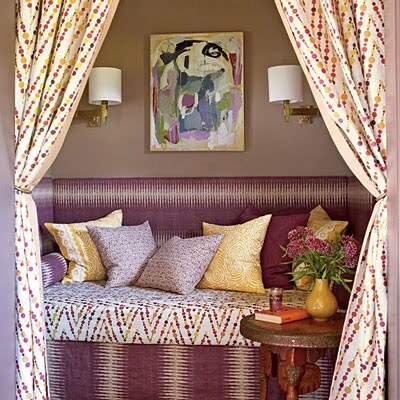 The one with the dreamy little girl, drapes, drawers and painted trim is so romantic. Hope all is well, Happy Monday!! I am all about little spots like this where I can curl up! The first and lasts ones are my favorites — so cozy-looking! I can not tell you how much I LOVE these nooks!!! That top one is sooo me! I wonder if I could put a little nook in the new little house! Thank you so much for sharing these photo's!!! They are all so different but all so comfortable. Yes, I'll take one! Love these- I have been begging my husband to convert a space that I think would be perfect- He keeps saying 'put it on the list'. I just love your sense for sensual environments & your feeling for…. P O E T R Y!!! 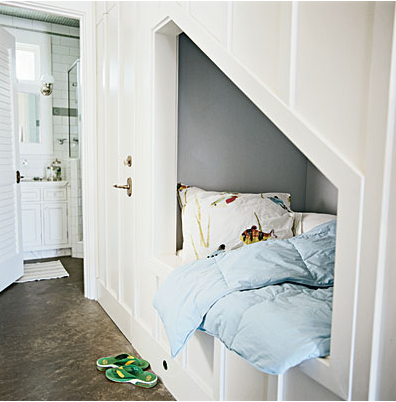 I love little nooks like these! The one with the girl in it looks like a fairytale. So sweet. These are wonderful! Reminds me of my childhood (and not so childhood dream) of wanting a window seat. I can just imagine getting lost in a book while soaking in the sunshine. Loving your parade of more modern nooks. Am dreaming of one today I tell you! It's so cold here in Sydney – icy rain and thunder grey clouds.. 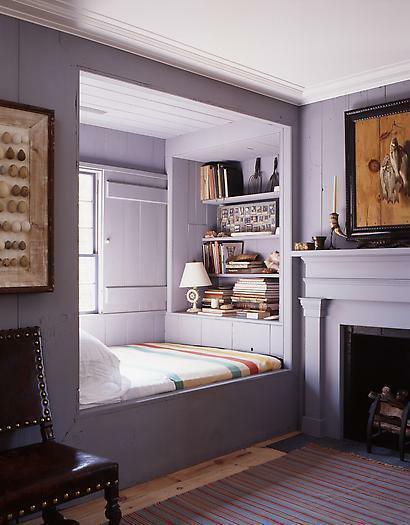 Such a great choice of nooks, I'd love to curl up in one now with a good book! How can I make a nook in my house?? I love these grown-up hideaways! aahhhh, so adorable! I mean, a nook with tufted seating…I die! 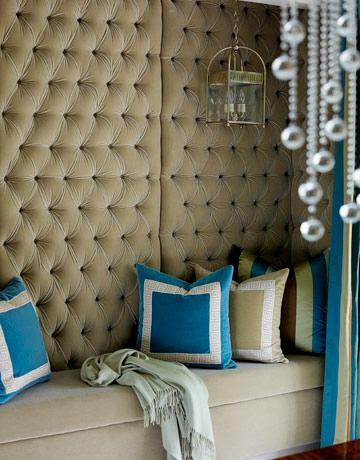 Love the tufted wall! 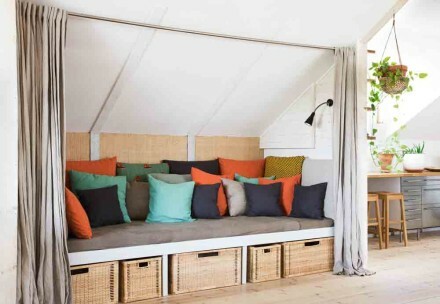 These are lovely nooks!